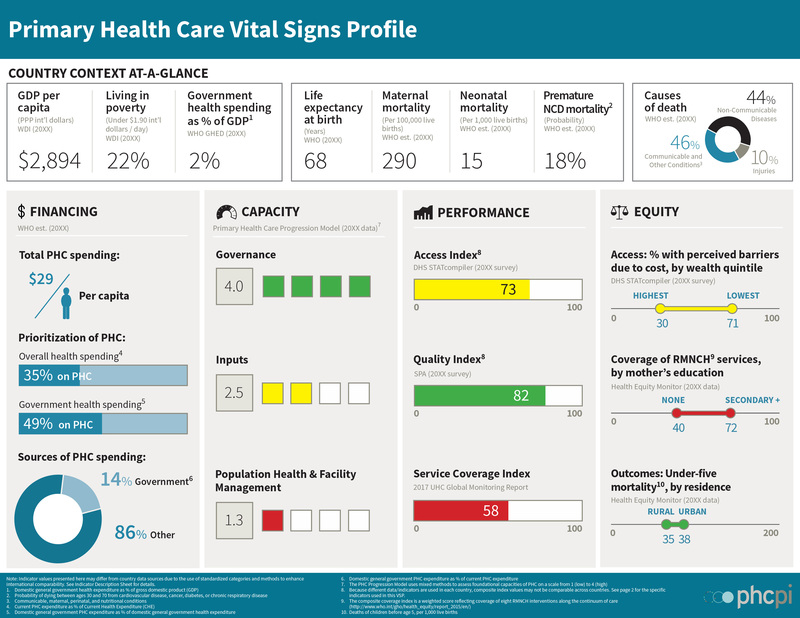 The Vital Signs Profiles are a new measurement tool that policymakers, donors, advocates and citizens can use to better understand, and ultimately improve, primary health care around the world. They provide an innovative snapshot of primary health care systems in individual countries, shining a light on where systems are strong and where they are weak. Click here for a short document about how to read and use the Vital Signs Profile. Click here to read the Primary Health Care Vital Signs report. Find Vital Signs Profiles for PHCPI’s Trailblazer countries here. Read the Vital Signs Profiles press release. The Vital Signs Profile is the latest development in PHCPI’s journey to improve primary health care through better measurement. PHCPI’s previous efforts focused on mapping elements of a strong primary health care system into a conceptual framework and identifying existing data sources that measure different dimensions of primary health care. The Vital Signs Profile goes one step further by compiling and analyzing multiple quantitative and qualitative data sources, helping to build a richer and more nuanced picture of a country’s primary health care system. PHCPI and several “Trailblazer” countries partnered to develop and release the first set of Vital Signs Profiles in October 2018. PHCPI and our Trailblazer country partners found that the process of developing the first set of Vital Signs Profiles helped to unearth rich and diverse data sources in countries, and unite country stakeholders around a common agenda of primary health care measurement for improvement. To help turn Vital Signs Profile insights into action toward primary health care improvement, PHCPI has developed the PHC Improvement Strategies – a set of tools and resources that countries can use to identify specific ways to strengthen their primary health care systems. Learn more about how these profiles are constructed. Learn more about the links between primary health care measurement and improvement. PHCPI is eager to collaborate with additional countries to develop and release Vital Signs Profiles. If you are interested in partnering with PHCPI to develop a Vital Signs Profile for your country, please contact us at info@improvingphc.org.